LAS VEGAS: The Las Vegas 51s professional baseball team of the Pacific Coast League (PCL), Triple-A affiliate of the New York Mets, will host "Donate Life Nevada" Night on Saturday, April 13 against the Colorado Springs Sky Sox, Triple-A affiliate of the Colorado Rockies, at 7:05 p.m. at Cashman Field, to help promote awareness of the need for organ donors. The first 2,500 fans through the gates will also receive a 51s Fleece Blanket Night, sponsored by Nevada Donor Network. 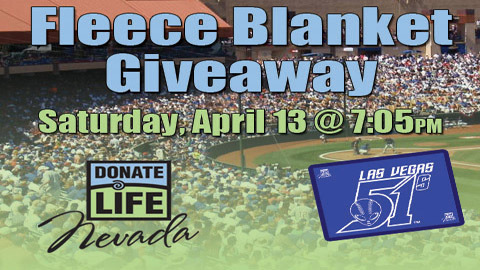 Donate Life Nevada is proud to team up with the 51s to bring awareness to the critical shortage of lifesaving organs, celebrate the lives of those saved by transplant and honor the heroic donors who have given a second chance to so many people. Donate Life Nevada will have a table in the concourse to help fans learn how the decision to be an organ, tissue and eye donor could save or change lives of more than 60 people. "We are excited to partner with Donate Life Nevada and to help educate the baseball fans on the importance of donating lifesaving organs," 51s General Manager Chuck Johnson said. "We welcome all of the organ recipients that will participate with the "on field" festivities prior to the game." Don Logan, 51s Executive Vice President, will present fellow Southern Nevada Sports Hall of Fame Inductee Simon Keith with the Donate Life Champion award. Simon was a star on the soccer field for many years, including at UNLV, now he's a supporter of organ eye and tissue donation. Keith was the recipient of a heart transplant in 1986 (27 years ago). "Simon has the true heart and soul of a champion, said Joe Ferreira, Nevada Donor Network CEO. "He never misses an opportunity to teach and learn from others to make the world a better place in honor of his heroic donor. He does this with his relentless care and compassion for those around him, no matter what their needs or struggles. The donation and transplant community is fortunate to have such a remarkable person as an advocate and a champion." Donate Life America (DLA) will work with state affiliates to present more than 50 Donate Life Champion awards to well-known athletes, teams and other role models within the sports community who have demonstrated remarkable support for donation. More than 117,000 Americans are currently waiting for a life-saving organ transplant. Catcher Landon Powell, a member of the 2013 Las Vegas 51s, will also address the crowd regarding his experiences and why he became an advocate/fundraiser for Donate Life and organ donation. Powell suffers from autoimmune hepatitis (had the disease since birth), a genetic disorder that caused his immune system to attack the liver cells and may be a candidate for a liver transplant later on in his life. His daughter, Izzy, passed away on January 25, 2013 from a rare disease and he and his wife, Ally, donated his daughter's tissue. "The Donate Life charity is near and dear to my family's heart for personal reasons," Landon Powell said. "The organization does great work nationwide and 1 organ donor can save up to eight lives. What better way to leave this world than to be a hero by being an organ donor." He is in his first season in the Mets organization and played in parts of three Major League seasons with Oakland (2009-11) and caught the 19th perfect game in Major League history and was behind the plate for Dallas Braden's Mother's Day gem on May 9, 2010 vs. Tampa Bay. This following links is in regards to Landon Powell's story. 1 organ donor can save up to 8 lives! 1 tissue donor can heal more than 50 people! More than 117,000 people are waiting for life saving transplants, that's enough to fill all the seats at Cashman Field nearly 13 times! A new name is added to the waiting list every 10 minutes. In Nevada, 543 people are waiting for life saving transplants. Organ donors save the lives of more than 25,000 people every year. The 51s are home for an eight-game homestand against Colorado Springs (April 12-16) and a four-game series against division-rival, the Sacramento River Cats, from Tuesday-Friday, April 16-19, all games at 7:05 p.m. Season tickets and mini-plan packages (10 & 10-Game You Pick'em, 20, 33-game plans) are available by calling the 51s office at (702) 798-7825.